An iconic Leicester landmark could return to the city's skyline. 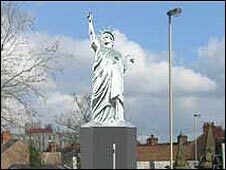 The Liberty Statue, which has been in storage since the old Liberty Shoe Factory was demolished in 2003, could be reinstated. But councillors want to know where people in the city would like to see it put back. The Swan Gyratory roundabout is a possible site. A replica could go on the roof of flats built on the factory site, as the statue would be too heavy. The statue, which is 17ft (5.18m) tall and weighs nine tonnes (9,000 kg), dates from the 1920s. It needs some restoration work, including replacing its missing torch. Councillor Patrick Kitterick, who is in charge of gathering opinion, said: "It is really important to that area. It celebrates the industrial heritage of the area and the manufacturing history by the canal and the River Soar. It also gives it a sense of identity. "I'm sure that if it is relocated it will resume its place as a local landmark and as a place for giving people directions by."